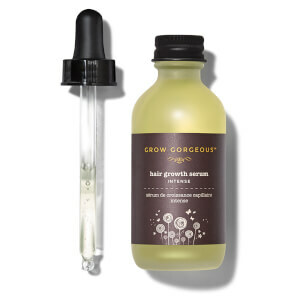 Achieve visibly thicker hair with the Grow Gorgeous Hair Growth Intense Serum. 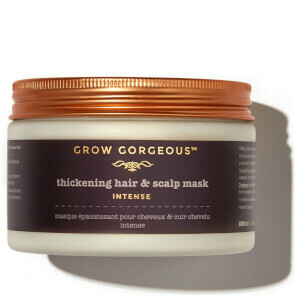 Developed with a high concentration of technologies for maximum efficacy, the formula aims to enhance the appearance of fine, deflated hair to promote fuller, healthier-looking locks. Aqua/Water/Eau, Butylene Glycol, Caffeine, Dimethyl Isosorbide, Maltodextrin, Propanediol, Glycerin, Parfum (Fragrance), Phenoxyethanol, Sodium Hyaluronate Crosspolymer, PEG-40 Hydrogenated Castor Oil, PPG-26-Buteth-26, Polyacrylate Crosspolymer-6, Arginine, Dextran, Lactic Acid, Hydroxyethylcellulose, Xanthan Gum, Glycine Soja (Soybean) Germ Extract, Triticum Vulgare (Wheat) Germ Extract, Urea, Trisodium Ethylenediamine Disuccinate, Acetyl Tetrapeptide-3, Trifolium Pratense (Red Clover) Flower Extract, Sodium Benzoate, Hydrolyzed Sodium Hyaluronate, Pentylene Glycol, Pisum Sativum (Pea) Extract, Gluconolactone, Scutellaria Baicalensis (Chinese Skullcap) Root Extract, Glycine, Larix Europaea (Larch) Wood Extract, Sodium Metabisulfite, Chlorphenesin, Ethylhexylglycerin, Camellia Sinensis (Green Tea) Leaf Extract, Zinc Chloride, Calcium Gluconate, Butylphenyl Methylpropional, Hydroxyisohexyl 3-Cyclohexene Carboxaldehyde, Limonene, Linalool, Alpha-isomethyl Ionone, Cinnamyl Alcohol. Finally a big size of my favourite product! 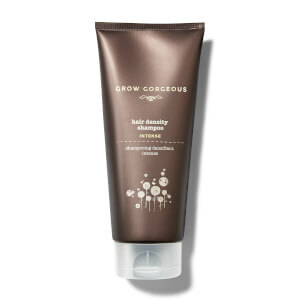 Love this product so much, has really improved the thickness and overall look of my hair. Plus the saving in the product is amazing, much bigger than the standard bottle (I think by 30ml) but the same price! Will be buying again! Bought for my boyfriend to rescue his hair, hopefully it will work!